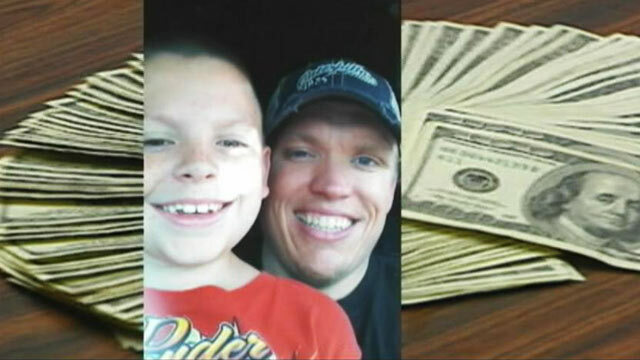 A curious 10-year-old boy rummaging through the drawers of his family's Kansas City hotel room came across a stash of $10,000, and he and his father turned it over to police. It's not clear when -- or if -- they will get the money back. Tyler Schaefer, 10, and his dad Cody were staying at the Hilton Airport Hotel in Kansas City last Saturday when the boy did his usual searching through closets and drawers. "He's one of those kids that likes to look for stuff," Cody Schaefer told ABC News affiliate KMBC. Tyler hit the jackpot when he found the cash, but didn't get to keep it for long. His father turned the money over to two policemen who were at the hotel. The police were just as shocked as the Schaefer family that such a large sum of money was lying in a hotel room. But they were also suspicious that no one has come forward to claim the money. "Generally if someone was missing $10,000 someone would call back, but no one has called back," Capt. Tye Grant of the Kansas City Police Department told ABC News. "Wouldn't you think if you lost $10,000 you would get it back?" The manager of the Hilton Airport Hotel refused to comment. The Schaefers may eventually get the money, but it will be 19 months before they can be sure the money is theirs. Under Missouri law, the Schaefers must file an affidavit within 10 days stating where and when they found the $10,000. A judge will confirm the value of the money, and send a copy to the clerk of the county commission. The family must then wait 40 more days and if no one has claimed the money, the Schaefers need to put a notice in a newspaper advertising the unclaimed sum for three weeks in a row. If the money is still unclaimed six months after the circulation of the last advertisement, then it can go to the Schaefers. However, there is a one year period in which the owner of the money can come forward and expect reimbursement from the Schaefers. Cody Schaefer does not seem bothered by the fact that he and his family may not receive the money, nor does he regret the decision to hand the money over to the police. "We didn't have the money when we got there, so it doesn't change much," Schaefer told KMBC.